The story of Lewis was shared with me a few days ago, an 11 year old dog, who at the age of 6 was diagnosed with Degenerative Spine disease. While most people would have opted to euthanize Lewis’s family did not! His family believed he still had the spirit of life and his job here was not finished! They chose to have Lewis a custom wheelchair made, taking their chances to see how he adapted, because of his family’s optimistic outlook on life Lewis was able to enjoy life to its fullest. Lewis and his wheelchair inspired many and touched the hearts of even more, including me. In Lewis’s last few years his family brought home a new puppy Libby. Libby has a breathtaking resemblance of Lewis, and the best part she was Lewis’s best friend. Lewis must have been a great teacher, as Lewis still lives within Libby through all the the characteristics she acquired from him. 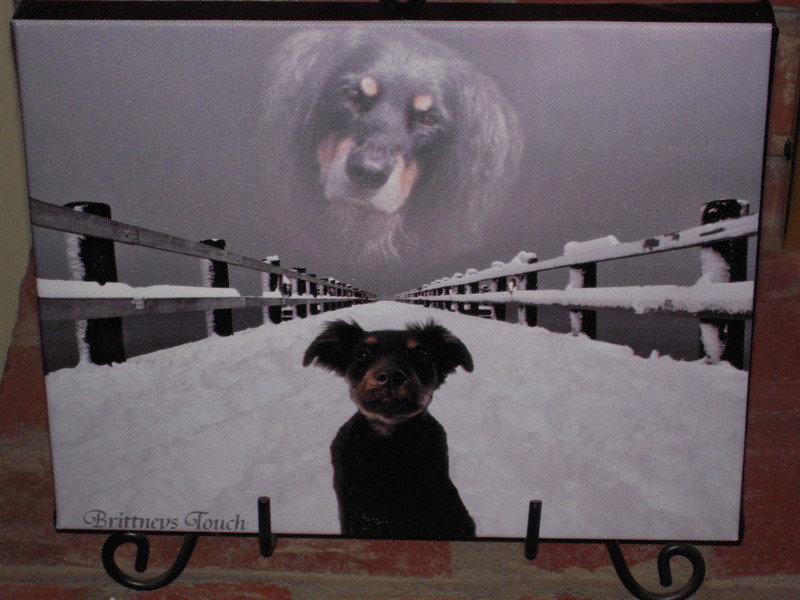 Hearing this story inspired me to do a Memorial Photograph to include both Lewis and Libby… I chose two pictures from the families gallery and I created a beautiful pet memorial photograph, and presented this photograph to Lewis’s family just one year after he passed away. Anna ordered a canvas print through Brittneys Touch of the combined photo below of Lewis and Libby… I was so happy with the way the photo transformation turned out and here is what Anna had to say about the canvas! Guess what came in the mail yesterday!!!!!!! WAHOOOOO!!!!! It’s already up on our mantle in our living room. We love it!!! 🙂 Thank you so much. I can’t wait to show everyone. Happy Holidays to you & big hugs (Libby & I are looking forward to meeting you some day). “Brittney, I think you do have a wonderful vision. We absolutely love how the snowy trail leads up to the heavens (or the rainbow bridge). It’s extremely touching!